Handwoven fabric in silk, rayon,cotton,leather & suede. 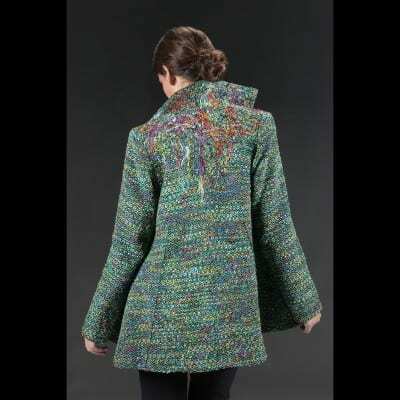 Women's suits and jackets, lined and interfaced. Frequently appliqued in suede; some embellished with thread "lace". Suede and leather also cut into narrow strips and woven in combination with yarns to create a woven leather fabric. I also use the rya knot with strips of suede to create neo-20's fringed jackets and skirts.